Clare believes the Tigers should have won both of their last two away games, but lacked composure in the closing stages of the tight contests. He said: “If you look at the Huddersfield and the Leeds games you’re scratching your head wondering why we aren’t an extra four points better on in the table. “It was really disappointing (at Huddersfield). We got a lucky try early on, but it took us so long to get going and the game plan we’d spoken about all week, it took a kick up the backside from Powelly at half-time to start executing it. “I felt the game was ours in the second half and I don’t know how we lost it, just a few individual silly mistakes, which everybody makes now and again, at crucial moments cost us. Sometimes you can get away with a poor decision if it’s at a different point in the game, but it wasn’t good enough unfortunately. “We just need to be a bit cooler and more calm and collected and execute what we need to do." 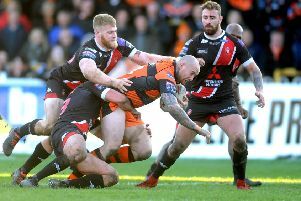 Clare is preparing for the usual tough Easter double-header and although the Tigers are down on numbers with eight players out for the first of the games against Wakefield Trinity on Sunday, he is backing the team to turn round its fortunes. He added: “We’ve got a good squad, we just need them to step it up and hopefully we’ll get through this Easter period with two wins.